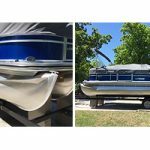 Is there any value in using Kwik Shine on a weekly basis (after a weekend of using the boat at the lake) on a metal-flake boat that has already been cleaned and protected with Boat Clean Plus, Boat Scrub, and Premium Boat Shine? What I mean is the following: Will the Kwik Shine add better protection and shine to the finish or is this simply not necessary? If you are going to use Kwik Shine on a weekly basis to clean, shine and protect your boat, it will give your boat better protection than once a year. The maximum life of the best UV inhibitors is about 3 months, after that it starts to break down and becomes exhausted. The polish may continue to protect the gelcoat against other environmental damage but not against sun damage, especially if it is on an upper surface such as the deck. By using Kwik Shine on a regular basis you are keeping up maximum UV protection. In addition, the shine from Kwik Shine is unparalleled and it makes metalflake look amazing. 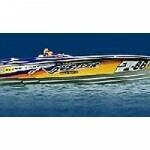 Premium Boat Shine is more durable and is recommended for boats that can only be polished once or twice a year.